The effect of strong evening sunlight hitting an everyday object is usually the impetus for my inspiration. On the other side of our garden was an ordinary iris that I’d seen before without a second thought - until one evening I saw the setting sun illuminating it from behind and making it glow against the dark shade of the hillside. Inspired, I immediately ran for my camera knowing the sun’s position would not last long. 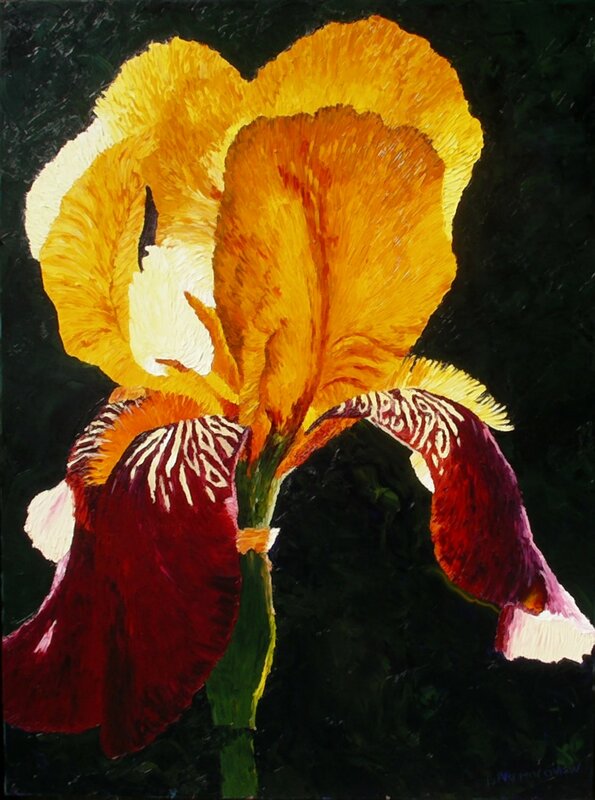 The iris seemed to have its own inner light and glowed from within. In a café one evening with the usual condiment containers on the table the sunset cut through the blinds and briefly streaked across the ketchup bottle and sparking chrome – until the customer at the window closed the blinds. This brief glimpse of the bright red ketchup bottle and sparkling chrome and glass was inspirational. One afternoon I was walking across our yard and I spotted the sun shining on a pansy. I sat down on the ground and looked at it closely. The arrangement of dark markings caused the pansy to appear to have a face. I noticed that it was not a single solid black color: but instead, striped variations of deep dark burgundies. Because pansies are so small, I wanted to paint it larger than life so that it would not be so easily overlooked and perhaps others might notice what I saw too. My favorite method is painting large canvases with thick texture: impasto in oil usually with a painting knife but sometimes with a brush. Painting with mountains of thick oil paint with the painting knife makes me feel as if I’m icing a cake. I am also drawn to the effect of chiaroscuro because of the drama created by high contrast of light and dark. Bright colors and complementary colors attract my attention just as much as backlighting or rim lighting. I also like the technique of tromp l’oeil in my still lifes. A mundane subject becomes inspiring to me when the sunlight strikes it and makes it sparkle and glow.